IN A RUSH TO ORDER? 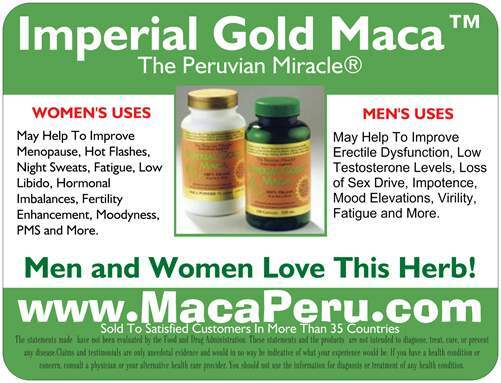 This Website Is A Wonderful Resource For Men And Women Who Are Looking For Extensive Information On Health Issues That Concern Them Most, And How The Peruvian Herb Imperial Gold Maca™ May Help Them Overcome Some of These Issues Effectively! And Loss Of Sexual Interest. 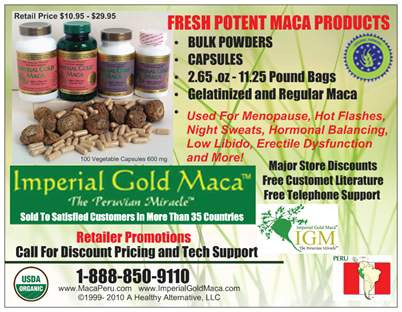 Imperial Gold Maca™ Is A Major Breakthrough in Herbal Health That May Promote Healthy Estrogen & Progesterone Levels In Women and May Improve Male & Female Sexual Function, Energy, Stamina, Alertness, Fertility Enhancement and May Reduce Thyroidal And Fibromyalgia Symptoms. YOU CAN'T GET A MORE POTENT PURE PRODUCT LIKE THIS ANYWHERE ELSE! Administration and are not intended to diagnose, treat, cure, or prevent any disease. All Prices Shown Are Subject To Change Without Notice!